It was a very plain but wholesome soup and I loved it as a kid. It contained fresh vegetables and I realised the main ingredients were lying around in the kitchen. Just to check I was going along the right lines, I looked up a couple of recipes. 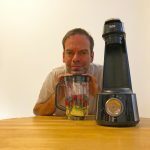 Some of them contained ingredients such as celery and ginger that I would personally eat, but I wanted to keep this plain and simple and stick to what I knew my children would eat without question. Don’t get me wrong, they aren’t particularly fussy eaters, but they can have their moments. Thankfully, they do not take after me. As a child, I was a notoriously fussy eater. If, all these decades later, I could remember eating and enjoying that chicken and noodle soup despite being horrendously difficult to feed, surely my own kids would like it? 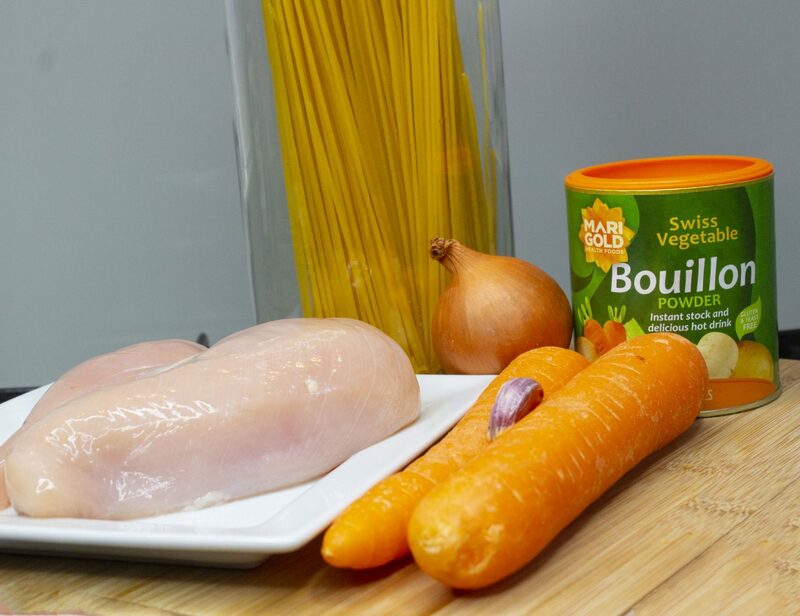 Add some water, and this is everything you need to make this chicken and noodle soup recipe! Lo and behold, they loved it. Although I have looked at other recipes, this is my own version. I’ve stripped it right back to the basics. 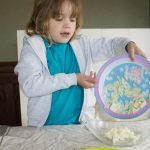 It’s really simple to make, is great for feeding to any fussy eaters and it can be easily adapted if you are giving it to adults or children who are adventurous with their food. I hope you enjoy the recipe, which will provide between four and six servings. If you make it, please do let me know. 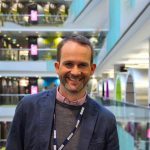 I’d love to see how you get on. Preparation time: 15 minutes. Cooking time: One hour. Peel, wash and dice the carrots. 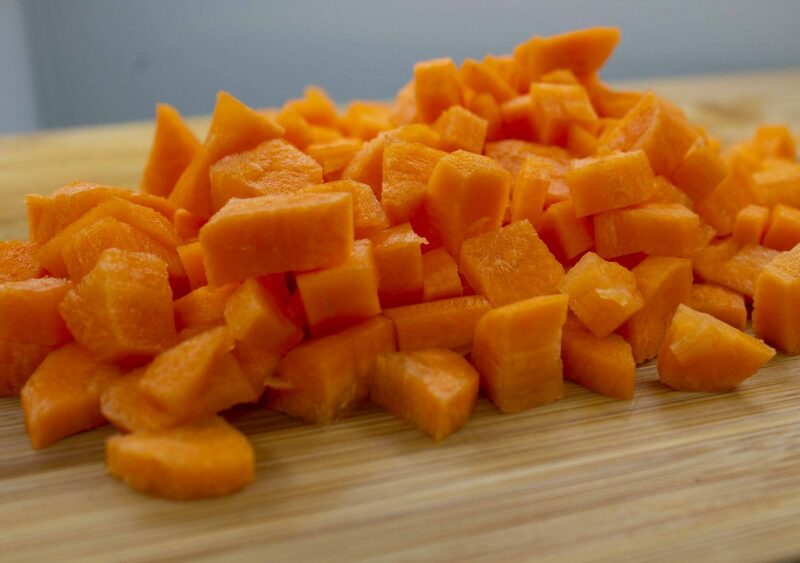 I chop the carrots into tiny pieces. If you are cooking for a mega fussy eater, you could cut them into large slices just in case you need to to remove them. Quarter the onion and peel the garlic clove. Pour half the water into a blender and blend the onion and garlic right down so it is a thick liquid with no lumps whatsoever. 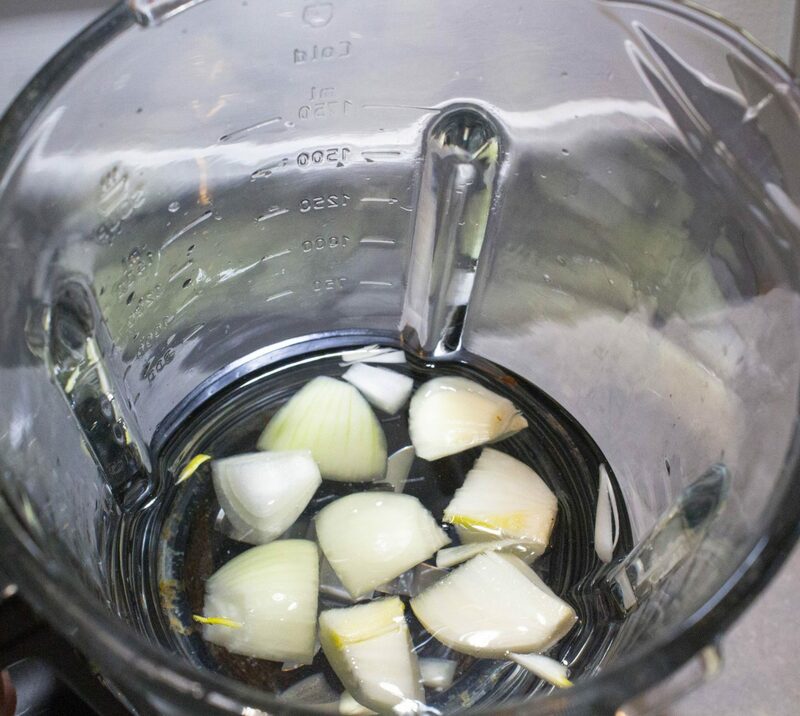 Place the onion and garlic in a food blender with about half the water and blend it right down so there are no lumps whatsoever. Put a splash of olive oil into a heavy pan and brown the chicken. Once browned, slowly add the water, onion and garlic mixture. Boil the remaining water and make up your stock. Slowly add the stock to the mixture and when it’s all in the pan, add the diced carrots. Turn up the heat until it’s boiling. Once boiling, turn the heat down so it’s simmering. 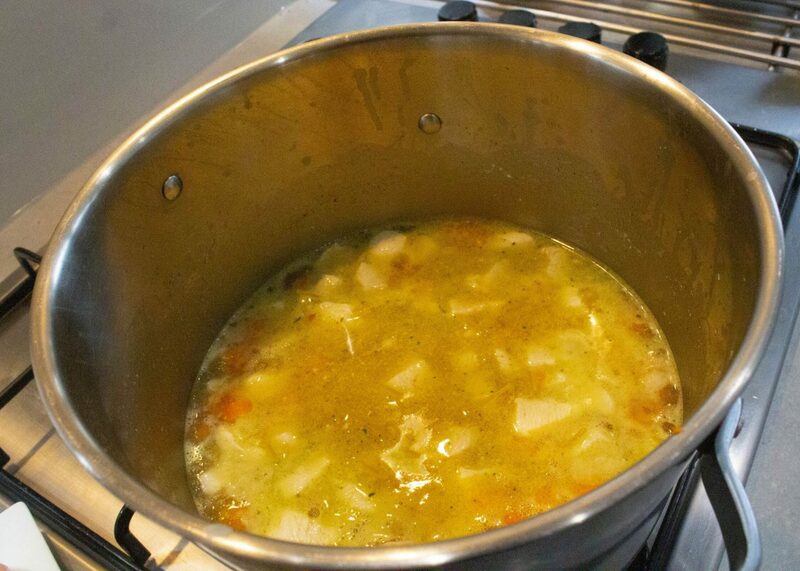 Allow the soup mix to simmer for around an hour. Take your spaghetti or egg noodles. Break them up into small pieces and add to the soup. While cooking, it may smell heavily of onions, but this will pass! Leave to simmer for about an hour. My suggestion is to serve with a crusty bread. 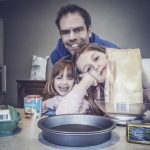 I have kept this recipe very simple as I know what my family will eat. You could, however, add a stalk or two of diced celery. You could also add sweetcorn or some fresh chili or chili flakes or season with white pepper. The recipe is very adaptable. On this occasion I made it with a heavy steel pan. I have, however, previously made it using a soup maker. 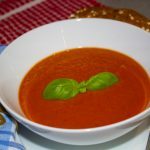 If you use a soup maker, simply blend down the onion and garlic, throw all the ingredients in to the soup maker and leave it to cook for an hour. As I say, this recipe is adaptable. It’s a very simple kid-friendly recipe. Needless to say, I am a big fan of it. Not only does it make a great meal, but it does take me back to my childhood. I don’t think I’ve ever cooked a food that’s had that effect on me! I hope you try it for yourself. Previous Post Collect memories, not photographs. Ah ha! Awesome, another chicken and noodle soup fan! It’s such a simple dish and ideal for kids as it only contains basic ingredients. Maybe we should try each other’s recipes?? Hi John, I remember having a chicken noodle soup very similar to this as a child too and I loved it. I’m sure that’s where my love of noodles came from! Don’t you love that sense of achievement when the children love something? Yes Debbie, I get a massive sense of achievement when I produce a food that the kids will eat and enjoy. In fact, I may well make them chicken and noodle soup tonight. Seems apt with the forecast snow.